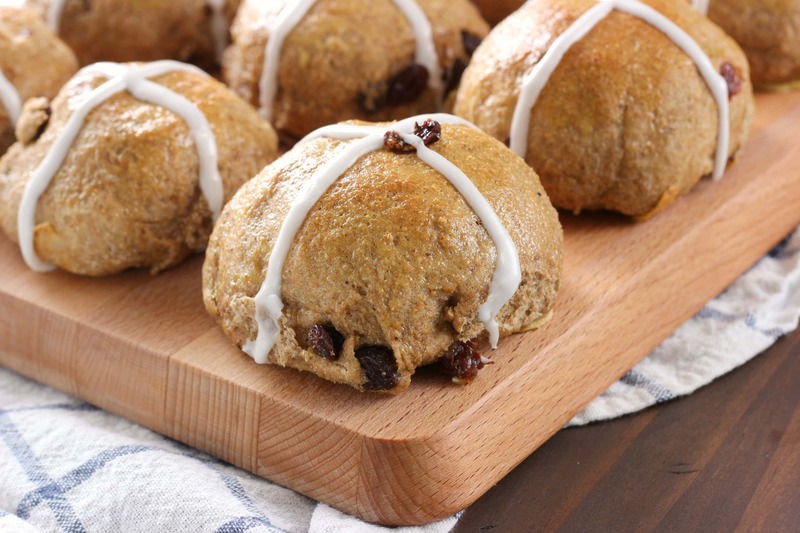 These tender Whole Wheat Hot Cross Buns are bursting with flavor from warm spices, a hint of orange zest, and sweet honey! *Recipe and text from 04/03/12/ Images updated 03/28/17. Easter is less than a month away! Time to start planning your menus. I wanted to try making hot cross buns last year around Easter but never got around to it. 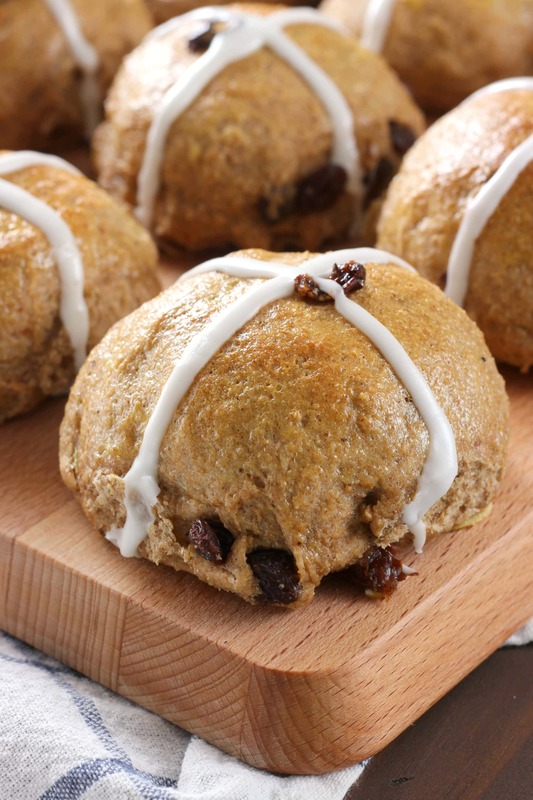 This year I wanted to make sure that these whole wheat hot cross buns were at the top of the list, and I’m glad I did. It is a very simple and straightforward recipe that, minus the time to rise, takes very little time and effort. Don’t let the long list of ingredients and steps scare you! A majority of the ingredients are the spices used to flavor the buns. As for the the list of directions, it’s a basic bread recipe that requires two rises. No complicated steps and the two rises are worth the time to achieve the end result! I was surprised at how fluffy the insides were even though they’re made with white whole wheat flour. Each bite is bursting with flavor from all of the spices. 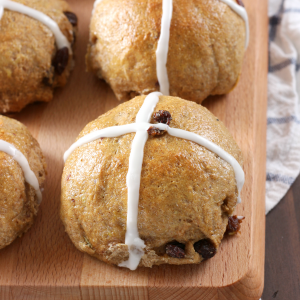 The hint of orange zest combined with the sweet glaze makes these hot cross buns a quick family favorite. Definitely a good addition to any breakfast, brunch, or dinner! In the bowl of a stand mixer, whisk together 3 cups white whole wheat flour, yeast, salt, and spices. Add in the milk, honey, butter, and eggs. Using the paddle attachment, mix the ingredients on low speed until well incorporated. Dough will be shaggy and sticky. Add in raisins and orange zest. Switch to the dough hook and start to knead on low. Slowly add in the additional 6 tablespoons white whole wheat flour, one tablespoon at a time. Knead to incorporate after each addition until the dough starts to pull away from edge of bowl and is only slightly sticky, about 3-5 minutes of kneading. Form dough into a ball, place in a bowl sprayed with non-stick cooking spray, and cover bowl with plastic wrap. Let sit in a warm, draft-free area until doubled in size; about 2 hours. Turn dough out onto a lightly floured surface. Gently press down to compress it. Divide dough into 12 equal pieces. Take the individual pieces and roll into balls. Place them in a 9x13 inch baking dish sprayed with non-stick cooking spray. Cover with plastic wrap and let sit at room temperature until dough has doubled in size; about 30-40 minutes. Preheat oven to 400. Prepare the egg wash by whisking together the egg and milk. Brush over the dough. Place on a middle rack in the oven and bake for 10 to 12 minutes, or until buns are lightly browned. Remove from oven and let cool on baking sheet for 5 minutes. Transfer buns to wire rack to cool. While buns are cooling, whisk together the milk and confectioner’s sugar. Place in a plastic sandwich bag and snip off a small piece of the corner (or use a pastry bag). Pipe two lines of frosting across each bun to make a cross. These look scrumptious, Jessica! 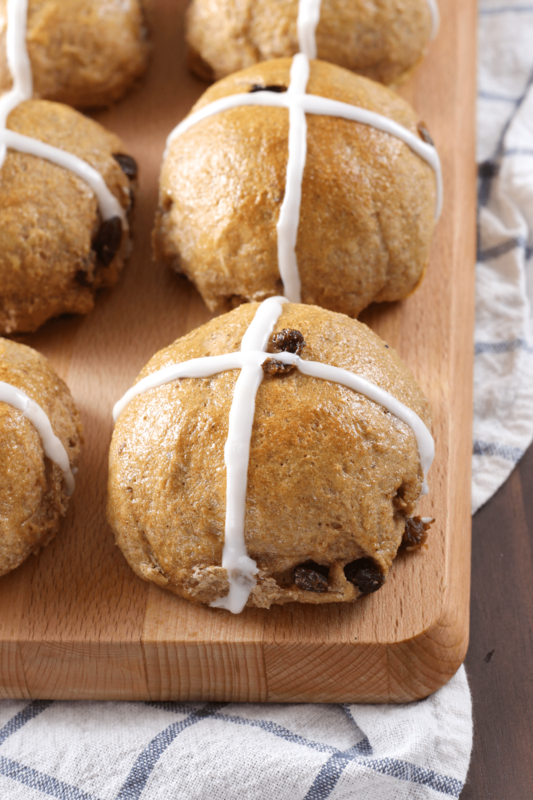 I have hot cross buns on my to-bake list 🙂 Thank you for sharing! Yum! These look so good. 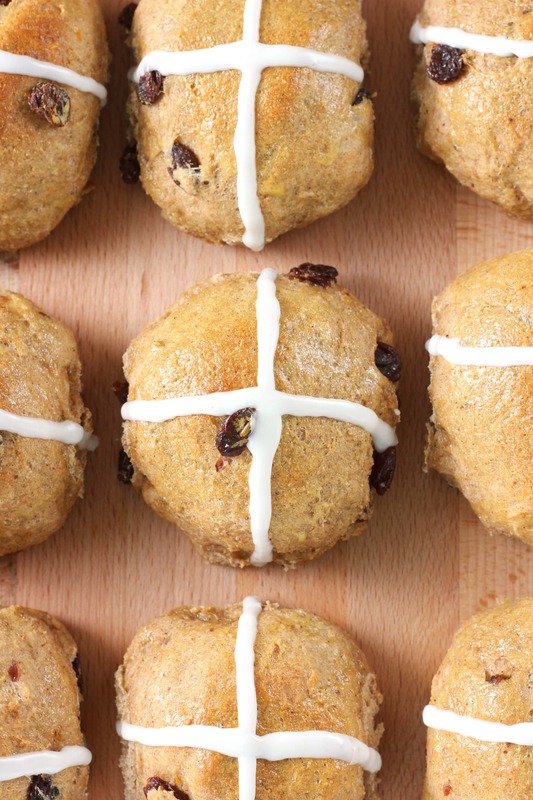 I’ve never actually tried a hot cross bun, but these are making me want some. Yours look amazing! Thanks for sharing! I love hot cross buns!! These look amazing and perfect for Easter brunch.